Group photo of some of the protesters today in front of City hall. 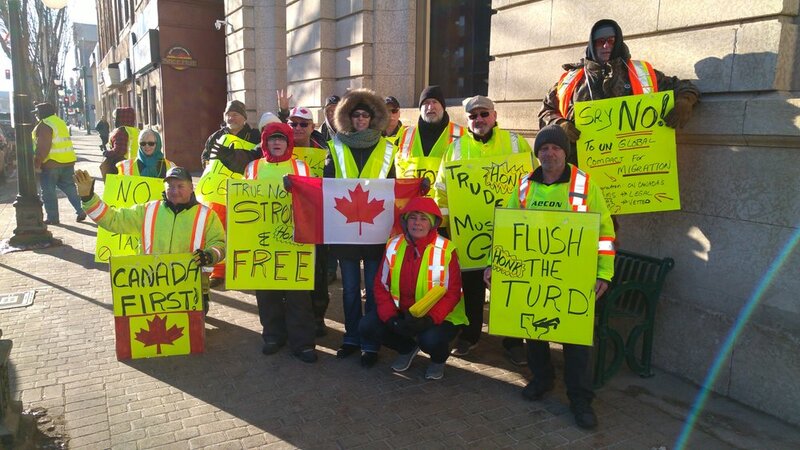 For the third Saturday in a row Yellow Vest Moose Jaw spent part of their Saturday morning in front of City Hall protesting against the lack of new pipelines, Bill C69, taxes and the UN Immigration Compact. Local organizer Al Church said he was “elated” with the turnout. “I started with one and we went to 24,” Church said. He said the group would like to say they are not racists and that he had been criticized by those opposed to the group. “There has been way more support than criticism,” Church said. Regarding being asked not to participate in a caravan to Ottawa put on by oil field workers, their families and others Church said he was disappointed with their decision. Wolfe said the group was being attacked and painted for something they are not. The group merely wants to be heard and their concerns dealt with, she said. The Moose Jaw Yellow Vest group plans to rally next Saturday in front of City Hall as part of a larger national movement to have their concerns heard and addressed by the Federal Government.